A huge thanks to both Carleton Handley and Vinny Mainolfi for passing on this abandoned prototype for us to put on the site which was for the Amiga platform. Vinny has been chatting with Carleton recently about his work, who then kindly passed on a copy of a title called Bloodline. The title is (according to Carleton) not even at an alpha stage and was supposed to be a cross between Halls of Things, Alien Breed and Paradroid. Code was by Carleton, with graphics by Adrian Page (who was a sort of trainee artist at the time). The title was not intended for any publisher in particular, and would have been touted to anyone who would be willing to buy it. This was a game being produced between contracts. Development was around 1993 time overall. 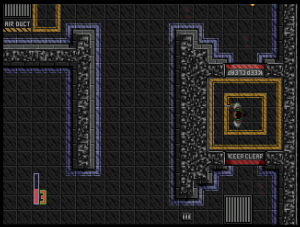 The levels overall are randomly generated around some fixed rooms and the aim is to clear the decks. 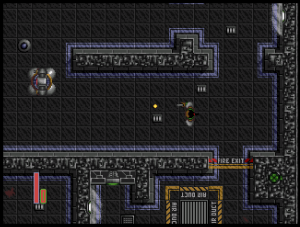 There are lifts (of which you start on one), pressing fire allows you to use it. 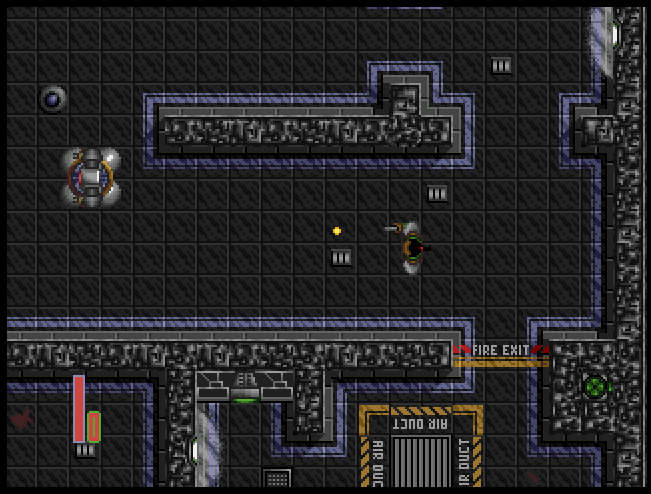 Pressing “M” will bring up a real time map and enemies have a line of sight vision, so that you can be stealthy. ESC will quite, so you can see the random level items when you start a game. There is also a Tram, which from the looks of things was not quite finished and was half way through programming when things were scrapped. According to Carleton, there is also a mini-game tucked away in the demo. Adrian Simpson of aGTW found it, and it’s a sort of puzzle game where you have to rotate shapes. To access it – go to a monitor station and press space (it doesn’t seem to work at all stations though). Although progressing well, Walking Circles ceased to be during development. Carleton was unfortunately out of a job, but luckily got a place at Tiertex almost immediately after. However, it meant the end of Bloodline. There was another title around the same time called “Fruit Game”, which was cancelled due to the game play not being quite right (sadly this hasn’t survived like Bloodline has). This entry was posted in Amiga, News, Prototype. Bookmark the permalink.